Virtual Reality (or commonly called VR) offers great promise for learning and development. Imagine being able to create immersive simulations for job performance requirements. Not just military and software applications, but also virtual reality learning in manufacturing and other risk-laden industries. Or how about in retail. Walmart uses virtual reality to give new hires the experiences of a Black Friday shopping crowd, easily one of the most frantic and stressful times in a Walmart employee’s life. There’s also United Rentals with their implementation of VR learning. Using virtual reality learning, United Rentals gives their Outside Sales Representatives the experience of the construction site in the safety of the classroom. Fidelity Investments provides empathy training for new hires via virtual reality. And then there’s the NFL. Some teams are using VR to help train Quarterbacks and other position players to perform in game situations. It allows for more intervention and control rather than live practice sessions; meaning optimizing the learning experience. If you want to hear more about it, you can watch this ESPN Story on it. Getting into virtual reality was once cost prohibitive for all but a few with deep pockets. How times have changed! It still requires an investment but not nearly as hefty as in the past. More about that in the next section. On the implementation side is where the costs have really dropped. Especially with the movement towards Bring Your Own Device, a smartphone, a viewer, and headphones allow for virtual reality anywhere. Much of our communication is visual. A good deal of how we remember is also visual. Doesn’t it make sense, then, that visual environments lead to a better learning experience? The wonderfully dazzling visuals in a VR format draws people in. One of the results on a more visually appealing environment is that learners are more engaged in the learning experience. It is more immersive and less distracting than other environments. For these reasons, retention and recall of the subject matter can be greatly improved. One study, in fact, showed that virtual reality improved knowledge retention by a whopping 35% over more standard training methods. The incorporation of 360 video or graphics and surround sound audio help create the immersive environment that makes the learner feel like they are really there. The devices also help to shut out the actual surroundings that it feels more life-like. Add devices where learners can also virtually manipulate items and it feels truer to form. Use audio interactions for role plays to help complete the experience. And it is infinitely safer than many on-the-job training experiences. Think about dangerous realms like a crane operator, soldier, manufacturing floor, or electrical worker. With virtual reality learning, you get the safety of a learning lab combined with the feel of real-life situations. One of the factors that the NFL example shows is the ability to create very specific scenarios. For example, to train quarterbacks on scanning the field and making play choices more effectively they created running plays for the subject to react to. Add a blitz, have a player fall down and create a broken play. And you can review them many times over. Noting patterns of behavior. With sensing equipment, you could even record eye movements, head movements, body posture, and other factors. By reviewing the “real” reactions, it’s then possible to suggest changes that can be implemented and rehearsed and tested again in the virtual environment. 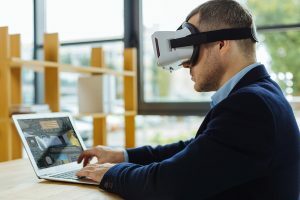 While it might seem overwhelming on the surface to dive into virtual reality learning, it actually is getting much less expensive. Here is some of the equipment and software you might need. This is the key component from the viewer or learner’s standpoint. The headset is the viewing device that gives the learner the visual experience. While there is some variance in how they work, most of the headsets out there rely on a stereoscopic display. In other words, they present two different angles of the same imagery. The result is that the device basically fools your brain into thinking it is in a three-dimensional environment. The really good headsets will usually also come with audio capacity either through a jack or Bluetooth and earpieces. Some also come with a hand-held controller for navigating the environment. 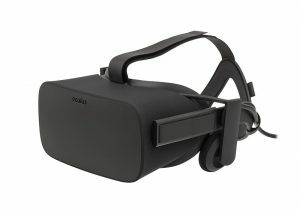 This is where it has become a lot more reasonable to invest in VR. You can go as low as $7 with Google Cardboard devices. Those typically only work with smartphones. On the high end, excellent headsets for desktop or laptop systems top out around $499. That price goes up with more add-ons and features you need. The headset is just the viewer. You still need something to view. The biggest growth in this area is smartphone-based VR. However, larger scale environments will likely require the higher power of a laptop or desktop unit. Like everything else, the insides make a difference. Your performance will never be better than the weakest link in the chain. Bad connectivity. Lower end processor. Insufficient memory. All of that will have a negative impact. Depending on the VR experience, you may need other items as well. While most headset devices come with controllers and audio gear, some of the less expensive ones may not. Always check to make sure what you are getting. There is also other gear to heighten the experience. For example, a product that has been out since 2013 is finding new life as a VR accessory. It’s called Leap Motion. It tracks hand and finger motion with amazing accuracy, meaning that incorporating exercises into VR that require manual dexterity becomes easier. There are also special chairs to provide the 360-degree experience of VR more readily. Also feedback suits, gloves, shoes, and other attachments. It depends entirely on the tasks that need to be learned and the investment you are willing to make. Keeping up with learning technologies can be tough! Why not rely on someone to help you keep up? We can help. Contact us at support@jcasolutions.com today.